To add your business or organisation free of charge, please use the form below. Your entry will appear on the site within 7 days. Important: Please submit only businesses that are based in Stanford in the Vale or the neighbouring villages of Shellingford, Hatford, Gainfield and Goosey. See the map below. Submissions from outside this area will be rejected! 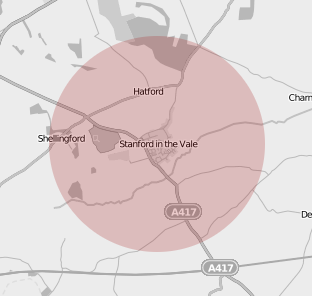 If the business listings on the Stanford website included businesses from Faringdon, Wantage and further afield then the list would be large and of less value to Stanford residents and to the local businesses it seeks to promote. Faringdon and Wantage have their own websites with business listings.